Astronomers have found more evidence that Mars was wet and warm in the ancient past, but the discovery comes with a twist: The water may have flowed below the Martian surface, rather than on top of it. The new study, which analyzed clay deposits on the Red Planet, revealed that the surface of Mars may have been dry and arid even in its distant past, with lakes and rivers dotting the Martian landscape for only brief periods. Water-carved landforms on Mars are just one source of evidence that liquid once existed on the planet. Orbiting satellites have also found beds of clay, created by chemical interactions between volcanic rock and water. 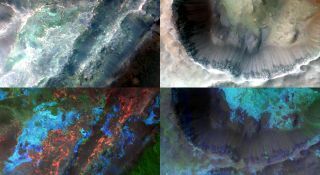 A team of planetary scientists, led by Bethany Ehlmann of California Institute of Technology, examined a decade's worth of images taken by the European Space Agency's (ESA) Mars Express and NASA's Mars Reconnaissance Orbiter, searching for clay deposits. Because different conditions give rise to different chemical changes in the same material, clay can be a distinctive record of the environment that shaped it. Their findings could help solve the mystery of where the water on Mars has gone. But a wetter Mars begs a question — where did all of the water go? The Martian atmosphere today is too thin to hold water on the planet's surface, so scientists have theorized that its atmosphere was thicker in the past. Some of the water may have been trapped in carbonate rocks or ice, as well. But current estimates don't account for all of the water lost, and the frozen formations just don't hold enough. The evolution of subsurface water during the first billion years of Mars history. Green indicates clay formations. During the Noachian period, which lasted from 4.1-3.7 billion years ago, clay formed primarily underneath the surface. At the end of this period and the beginning of the next (the Hesperian period), volcanism was widespread, and rivers and lakes crisscrossed the land, forming clay at the surface. As this period ended 3.1 billion years ago, the planet cooled and clay formation ended. All clays aren't formed by rushing rivers, however. On Earth, melted snow and groundwater flow through underground volcanic rocks, heating it and causing the two to chemically interact to form clay. Hidden beneath the Martian surface, these crustal clays show up in heavily eroded areas or via crater impacts. A third type of clay is created by the intense weathering of volcanic-formed basaltic rock. While river-formed surface clay tends to be found in low-laying basins (since the water runs downhill), these weathered clays are created at higher altitudes. Ehlmann and her team found evidence of all three types of clay on Mars, but the underground clay dominated. "The most stable, long-lasting, clay-forming environment was in the subsurface, evidenced by the widespread crustal clays," Ehlmann told SPACE.com via email. This means the majority of the clays on Mars formed underground, and did not require surface water. The research is detailed in the Nov. 3 issue of the journal Nature. The portrait of Mars clay beds paint is one of a dry, arid surface covering a wet and tumultuous pulse just beneath the ground. During warmer seasons, or after surface heating activity such as volcanism or a large meteor impact, ice could have melted and rushed across the land, cutting wide swatches. Once started, the racing torrents would have been difficult to freeze until they slowly tapered out. These lakes and rivers could have mixed up clay as they raced along, spreading it across the surface of the Red Planet, until the water froze, seeped back under the surface, or evaporated. "The best Earth analog for the crustal clays would be Iceland, where hydrothermal systems below ground are fed by snow and glacial melt — and a bit of rain, because it's Earth," Ehlmann said. Over time, the planet's interior heat cooled off. Volcanoes ceased, and large impacts declined, no longer fueling the hydrothermal activity. Clay formations ended around 3 billion years ago, leaving the dusty Red Planet that we see today. Water is generally considered ideal for generating life, and a wet Mars seems better suited. But a Mars where water exists primarily beneath the surface doesn't mean the planet is automatically barren. Ehlmann said that such underground reservoirs could have provided habitable scenarios where microbial life might have thrived. Even the short-lived surface waters fueled by melting could have potentially hosted life.